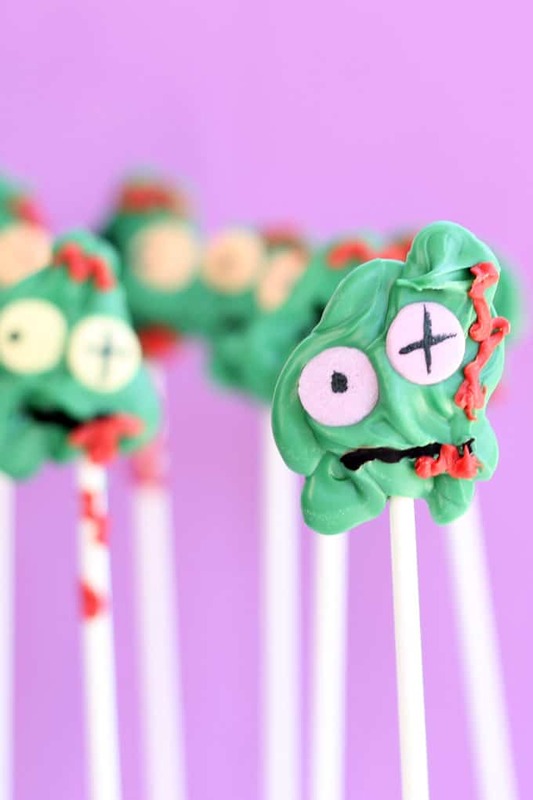 These chocolate zombie candy pops are easy to make and perfectly creepy for your Halloween party. I just can’t get enough of zombies. 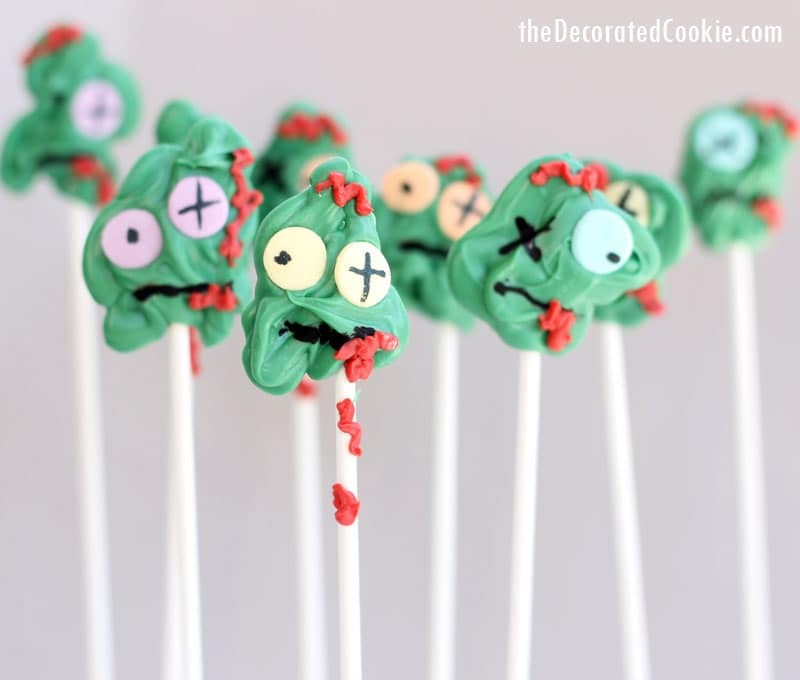 Not just The Walking Dead, whose return I’m eagerly awaiting, but edible zombies. 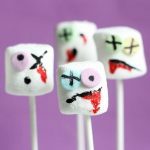 First, these zombie marshmallows. 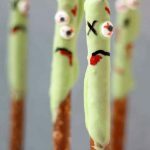 Then, these zombie pretzels. 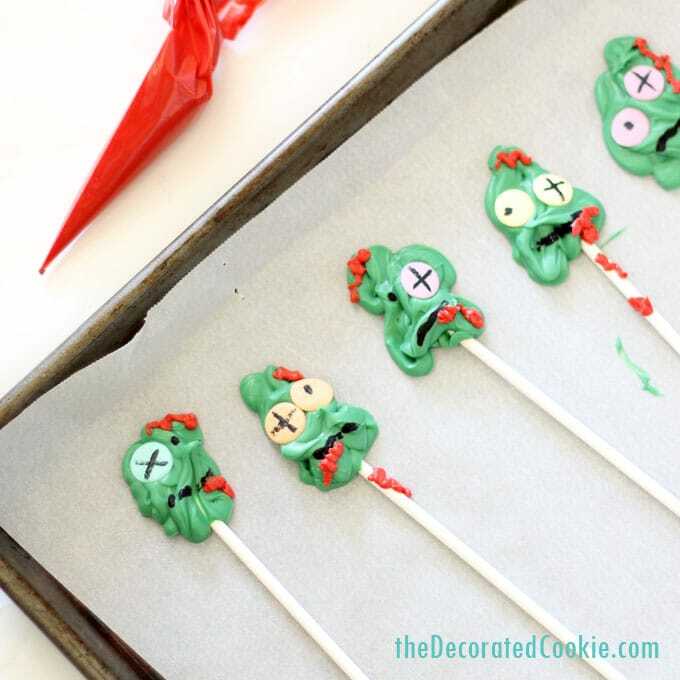 Now these zombie candy pops. I think we’re close enough to Halloween to pull out the zombies. 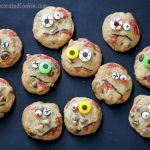 These are so easy to make because messy and imperfect makes for an even creepier zombie. Need more zombie ideas? Check out this roundup. 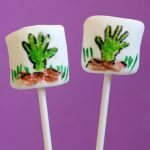 The written, detailed how-tos for zombie candy pops are below, but here is a quick video to show you how easily it’s done. Wouldn’t the apocalypse be so much easier to handle if these were the zombies coming for you? *Find all of the above at the craft store, or click the links to see what they look like online. 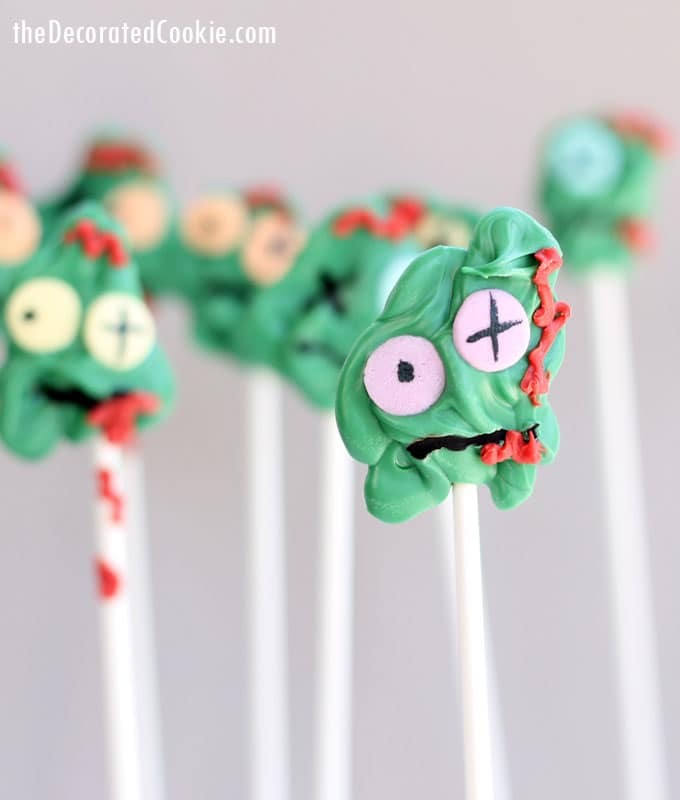 For the black candy color, you can use regular gel paste food coloring if you don’t want to buy something else, but the candy color sticks to the candy much better. For lollipop sticks, choose the 6 or 8-inch size. Pour a few drops of candy color on a piece of wax paper or paper plate. 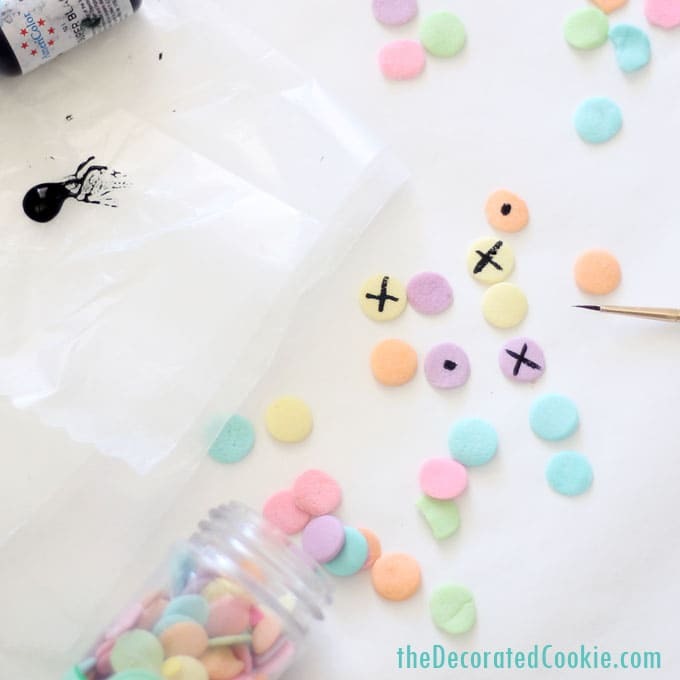 Use the paint brush to draw “X”s and dots on some confetti sprinkles. Set aside. Line a baking tray with wax paper or parchment paper and set aside. 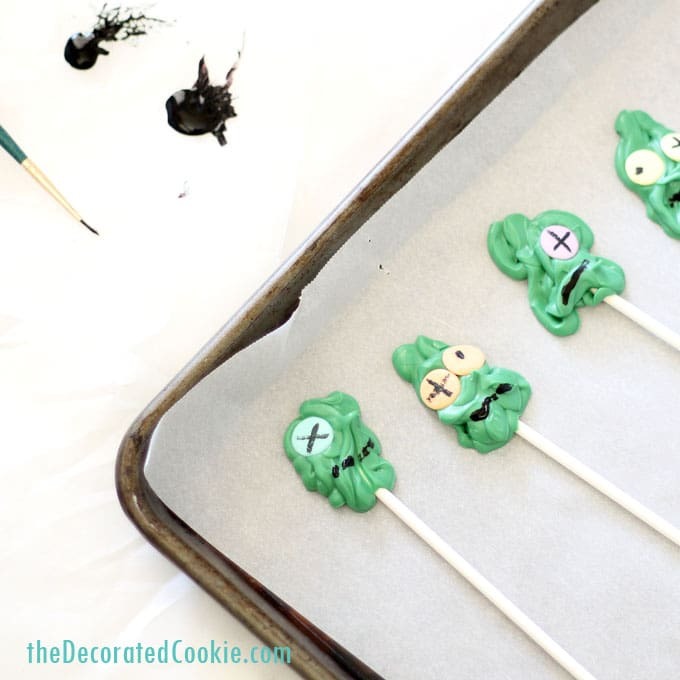 Pour some green candy melts (about 1/2 to 3/4 cup) into a disposable decorating bag. Heat at 70 percent power for 90 seconds. Massage the bag and continue to microwave for 15 second intervals until fully melted. Do not let the candy melts get too hot. Alternatively, melt the candy melts in a microwave-safe bowl and pour into the bag. Snip about 1/4 inch from the tip. Pipe a dot on the tray, place a lollipop stick on top, then pipe the zombie head on top of that. The weirder the shape, the better. Immediately stick one or two of the prepared sprinkle eyes on top. Fill the tray with your zombies and let set about 30 minutes. Use the paint brush to paint lines for mouths on the zombies and “X”s for eyes on zombies with only one confetti sprinkle. Melt some red candy melts as you did the green. Snip just a bit off of the tip and pipe blood on the zombies. Let set at least an hour. I have a grandson, well I have 7, but one that will really get a kick out of these! Thanks for another fun, easy idea! Absolutely! I’ve used candy eyes and they work great! (even better, actually, I used a combo of big and small) Definitely post pictures!!! !